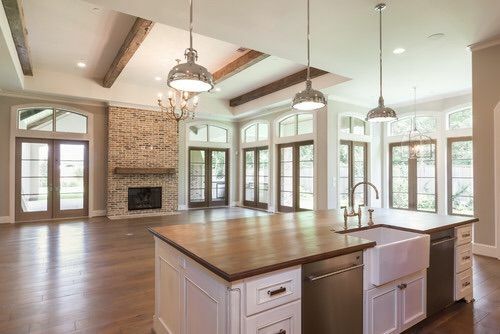 Did you ever think brick fireplaces would become popular again….or that people would actually want to include them in their “must haves” for their new home builds??!! Well, I am here to tell you – yes & well… YES. They are still going strong my friend. 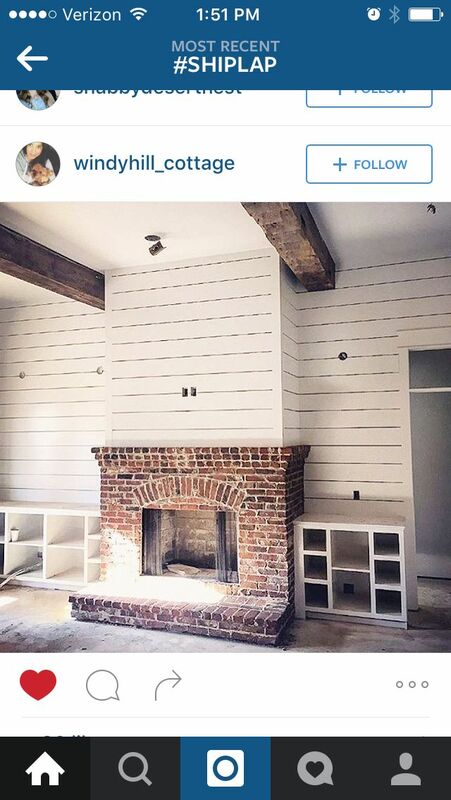 And for those of you have “remove ugly brick fireplace” on your bucket list, there is hope for you too. You can white-wash it, or thanks to Chip & Joanna, you can now try the German Schmear technique to get rid of it once & for all!! WOOHOO!! Let’s get to it!! 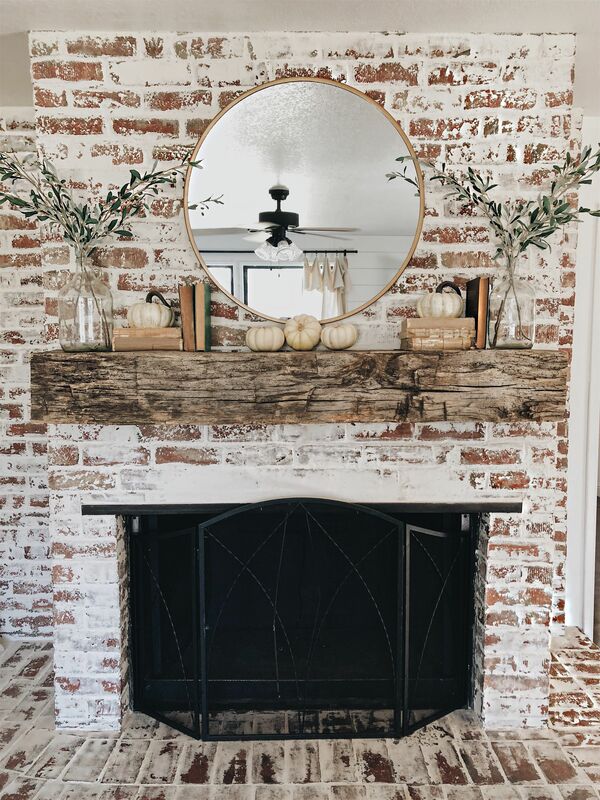 Today I will be finishing the second portion of my brick fireplace obsession: 35 Gorgeous Natural Brick Fireplace Ideas (Part 2) and you won’t want to miss all the good info!! 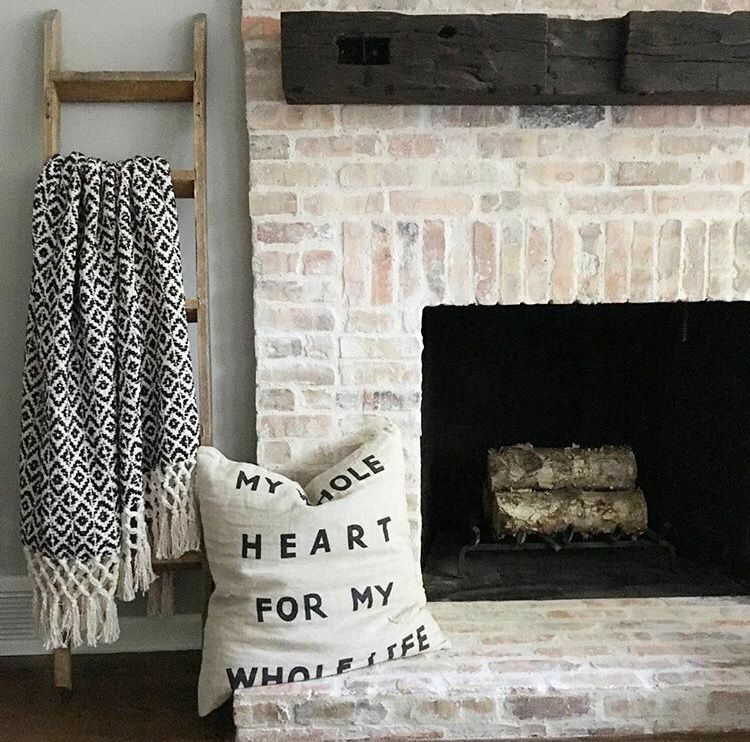 In this post, I am focusing on natural-colored brick (brick that is left natural, white-washed or has the German Schmear technique) fireplaces. If you are looking for painted white fireplace inspirations, click 30 Stunning White Brick Fireplace Ideas (Part 1). If you are joining in from part 1, welcome!! So, what is the difference between natural, white-washed brick, and the German Schmear technique brick? I thought the best way to explain it would be through pictures. Natural brick is just like it sounds, nothing is added or taken away from it. The brick stays in it’s original beautiful state. The only changes made are through the color of the grout lines: matching grout keeps the look seamless, and contrasting grout gives it depth. White-washed brick uses a diluted paint mixture (like a 50/50 paint to water ratio). You can control how much of the brick that is covered by the amount of water you dilute the paint with. The more water that is used: the less coverage you get. And vice versa. FYI- According to wikipedia “Schmear” is a German word which means smear or spread (like as in butter). That is why you will see it with both spellings: as German Schmear or German Smear. Ok….just had to get that settled. Now we can move on. The German Schmear technique uses a mortar mixture (not paint)- (like 70/30 mortar to water ratio). It is a thicker mixture more like pancake batter. You can control how much of the brick that is covered by how much of the mixture you apply to the brick. The differences between white-washed and German Schmear: the German Schmear technique covers the brick (partially or completely) with the mortar mixture, hardens, is permanent, and is more time-consuming; whereas the white-washed method covers the brick with an opaque color (can still see through to the brick), is not permanent, and is less time-consuming. ***If you want to learn more about the white-washed and German Schmear techniques, go to the end of the post for some tutorials. These tutorials are mot mine or performed by me, just ones I recommend for you to try*** So let me know which one you choose! They are all great tutorials. As you scroll through the pictures and oohh and aww over your favorites….shoot me a comment at the end with your favorite picks!! I can’t wait to see what everyone chooses. Now…..let’s get to the good stuff!! Can you tell how the brick is natural in the picture above (you can see the true brick color) where in the picture below the brick has been white-washed (has a slight white-ish glaze covering it)? In both of these fireplaces, the grout lines are white, contrasting with the brick color to give it depth. If you’re loving the doors over the fireplace to hide the tv (picture above), check out 55 Incredible Barn Door Ideas: Not Just For Farmhouse Style. This post is filled with amazing ideas and resources to help you achieve this look. If you love all things shiplap or want to learn more about it, click Shiplap Guide (part 1) and 41 Shiplap Ideas: Not Just for Walls (part 2). These posts will teach you everything you want to know about it, and give you a ton of inspiration for where you might want to use it in your own home. Looking for more outdoor patio inspiration, follow my pinterest board: outdoor patio love or my post: 33 Best Outdoor Seating Options. This post is filled with great outdoor finds. If you love round mirrors, check out 15 Best Round Mirrors. I have a crazy obsession with them, so my house is filled with them!! I love how the round shape softens all of the hard rectangular edges of the fireplace below. It brings in a very warm, inviting feel to the room. The German Schmear is soooo gorgeous- it is in both of these pictures, above & below. 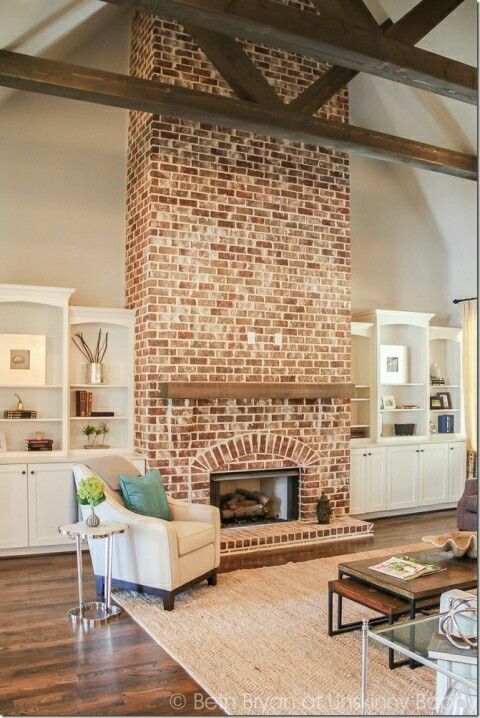 It creates such an authentic look, giving an ordinary brick fireplace a ton of character. I LOVE it!! If you want to learn how to do the German Schmear click on the link at the bottom of the pictures. If you want to learn about white-washing brick, scroll down to the next session for those tutorials. They all share great tips and information. Let me know how it goes…… I’d love to get some feedback from you. Didn’t have a chance to see (Part 1) click here 30 Stunning White Brick Fireplace Ideas. Need some inspiration in the kitchen, click on 12 Best Modern Farmhouse Bar Stools, or 15 Easy Solutions – Kitchen Orgnization 2018.